Social media has become one of the biggest tools used by brands to connect with their targeted user base. The fact of the matter is that 86% of the people on social media follow brands they want to associate with. A big chunk of customers in this day and age is tech savvy. They want to stay updated with latest offerings of the brand and in return want good support for their grievances. This makes social media presence critical for all businesses, big or small, local, international or of any industry. Social media marketing can be highly fruitful if businesses don’t forget that no social media channel is a broadcast platform; It’s a conversation medium. However, some brands take this social media interaction a bit too far by bombarding their users with irrelevant content. Rather than just posting updates on your social media profile, the better approach would be to engage in conversations with your user base. You are on Social media for a serious business, don’t repeat mistakes of failed online businesses. Interacting without a personality – Why most of the brands fail on social media despite being active? A big reason behind their failure is their content that seem to be auto generated. To the end consumer, it is like interacting with a robot. And, you do not want that, right! So to make your target user base feel that they are interacting with you/your-people, rather than robots, share personalized posts. This would make your social media profile have a defined personality and highlight everything good about your brand. Overtly trying to be funny – It’s a widespread notion that humor is the best way to engage with consumers. However, some brands go overboard while being funny in an effort to gain traction. This, in turn, leaves a negative impact on the target consumers. Not replying to queries – The biggest blunder an ecommerce brand can make on social media is no reply to messages and queries of followers. Most brands think that users only follow them on social media to get latest updates and offers. Well that’s a half-truth; consumers also want brands to solve their queries related to products and services whenever they reach out to them through a social network. And, how quickly you do that also matters to them. Ecommerce based small and big businesses are the biggest beneficiaries of social media. Studies show that 75.3 percent people make a certain purchase on ecommerce marketplaces due to the influence of social media. When it comes to new startups, social media is the biggest platform to funnel traffic to their websites. Most of the newly setup businesses in the ecommerce arena get traction via social media platforms only. 80% of the people see a product/service 2-3 times in their social media feeds before they make the actual purchase. For the rest, this figure jumps to 5-8 times, which means that one has to be patient and persistent with their social media strategy in order to have optimal results. However, there is a fine line between being persistent and bombarding the audience with posts in order to entice them. If you go overboard, they are most likely to unfollow you on social media. In order to ensure that people see your post multiple times and it does not seem that the same post is bombarding them repeatedly, we advise you to minimally edit and revise your social media posts. Change the headline or the photo. When posting a product photo, use different background or filter to make the image look unique. 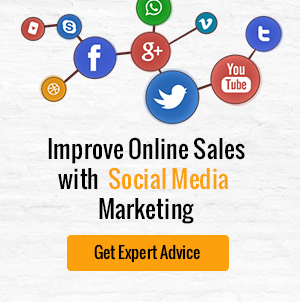 If you have an online business, you should incorporate a social media strategy in order to increase sales. If a person is following you on social media, they are more likely to remain your customers; loyal customers in fact. Social media is not just for promoting your brand, but to engage with your audience and start a conversation. Your response rate and response time on social media are crucial when it comes to converting a follower into the customer. You need to balance your social media strategy by equally diving your promotional messages and replies. Brands and online businesses need to understand that their targeted user base is not only interested in overtly promotional content but want to reach out to a ‘name’ (a big name in their eyes) they know for a product or a service. A proactive social media approach will strengthen your marketing strategy and with the best practices, you can easily entice your social media followers to buy because of your social media posts. Most of the social media platforms have already started to add “BUY” buttons on to their platforms after taking cognizance of this fact. The bottom line is that social media does have a diverse effect on the brand presence of an online business. ecommerce stores can leverage social media the most and the longer you take to recognize this, the more you will be on the losing side. Posted in Social Media by FATbit Chef.